Panoramic Views lives up to its name with views of the ocean, breathtaking sunsets, and star-filled night skies. You will feel like you're living on top of the world in this lovely vacation home located in the heart of Kitty Hawk with all the comforts of home. This Outer Banks home is in a quiet neighborhood on west side of the highway, for a more peaceful vacation experience. Enjoy ocean views from the upper deck or enjoy the shade of the lower deck while you read your new book and have a cool drink. The beauty and wildlife of the sound await exploration. A short walk down the street takes you to a walking and bike path adjacent to Kitty Hawk Bay. Bring your bikes and enjoy several cycling routes on the west side. When the sun and surf at the beach beckon, walk the ½ mile to the beach or drive and park near the public beach access at Kitty Hawk Road. Weather is moderate in the winter and a quiet and relaxing place for snowbirds. 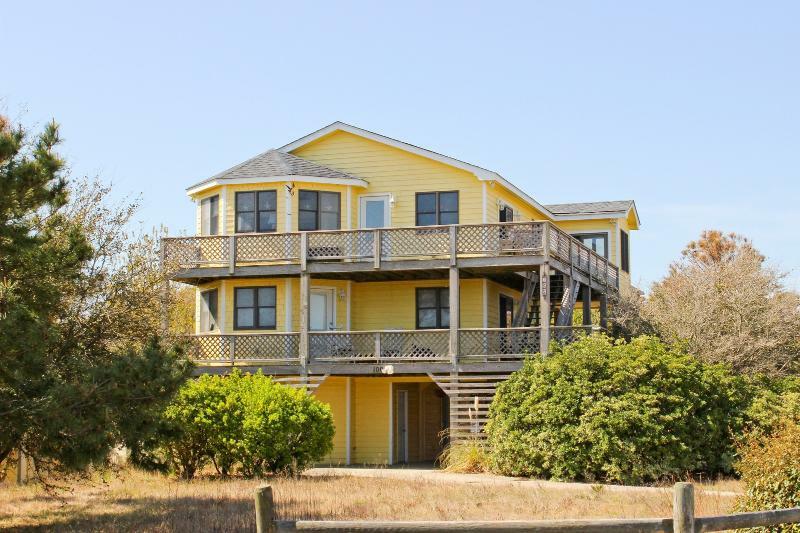 Panoramic Views’ convenient location, near MP 4.5 of Croatan Highway, puts you near all of the great Outer Banks destinations and activities. Those looking for adventure can enjoy other outdoor recreational activities such as water sports, hang gliding or fishing from the surf or piers. More laid back vacationers can enjoy the local shopping, dining and site seeing. Several popular restaurants are within walking distance of Panoramic Views. You will be close to everything needed to have a fantastically, memorable OBX vacation. The Outer Banks of North Carolina is one of the most popular summer weekly vacation destinations on the East Coast. The Outer Banks is regularly selected as one of the top 10 beach vacation areas in the United States. For detailed information about the many activities and attractions of our area search for the Outer Banks Visitors Bureau. The bed in the master bedroom was so comfortable, I didn't hear or care what everyone else was doing. The home is nicely appointed with furniture and artwork themed for the area and equipped with top end appliances for the kitchen and laundry. With two decks, each at a higher elevation, we could sit in the shade or take in the views. The house is large, on three levels, with the kitchen on the upper level. There is an office area with internet connection and TV. It is a bit of a trek to the beach, but that did not slow anyone down. There is so much to see and do in the area, the location was preferable to me. North to Duck, south to the Wright Brother's Memorial, great food a stone's throw in any direction, something for everyone from age 5 to 60. It was nice to get back to North Carolina and the OBX area. This is a great family home. This home is spotless (kudos to Keil) and the views are wonderful! What you see in the photos is what you get, so you won't be disappointed, very nicely decorated. The layout of the home is very open, yet there are plenty of rooms tucked away for everyone's privacy. While there are no photos of the bathrooms, fear not. All are full bathrooms with one on the main living floor/ two on the bedroom level. Each is well-maintained. The main bathroom is very large. The master bath is beautiful with a gorgeous walk-in shower. Each bedroom has an outside entrance onto a private deck. The bedrooms are on the middle level, which provides a cozy feel for slumber. Very workable kitchen with all the amenities. A scenic bike/walking trail is just down the street. Eileen was wonderful to work with and answered all my questions. Security deposit was returned promptly in less than 2 weeks. Only recommendations would be a gas grill and recycling bin. No regrets on this one!! Great location, quiet, convenient to the beach and golf courses--and the seafood shop(first things first). I highly recommend this property for any vacation planned for the Outer Banks. Spacious rooms, very clean, close to beach access with a life guard. Nice neighborhood. The owners are easy to work with and very prompt to answer your questions. Would definitely rent again in the future if I return to the Outer Banks. Although not on the beach this was the perfect location for us. Very short drive to the beach. Excellent bike paths. Very clean with lots of room. Andy and Eileen were great to deal with! We stayed here last summer and had a super time. The house is beautiful and located close to everything. We have 4 children and there was plenty of room for all. The kitchen was perfect as we ate in quite a bit. The large deck was very enjoyable with an ocean view. Over all great stay. You can't go wrong with Panoramic Views.